Mooc.org: Google EdX online-classes partnership is "YouTube for MOOCs"
Mooc.org, the new online-courses site from Google and EdX. 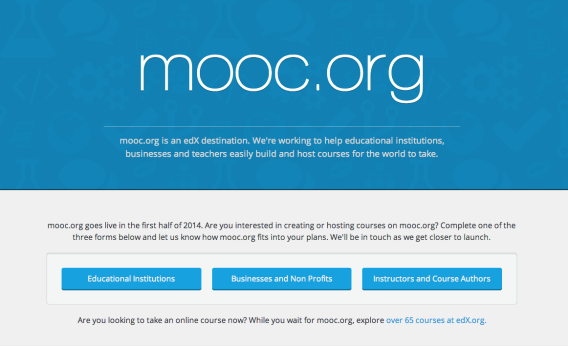 The site is called mooc.org—MOOC being the unfortunate acronym for “massive open online courses.” It will use the same EdX platform through which professors at Harvard, MIT, and other EdX-partner universities now offer their online courses. But it will be open to everyone, including businesses, governments, and private individuals as well as professors at non-EdX colleges. Meanwhile, Google will also become a partner in developing the Open EdX platform itself—that is, the open-source technology that allows professors to conduct their courses online. Earlier this year Stanford also announced it would partner with EdX to develop the platform, a significant move coming from the university that had birthed perhaps the two best-known for-profit MOOC startups, Coursera and Udacity. The appeal of EdX is that, as a nonprofit, it is presumably under less pressure than businesses like Coursera and Udacity to turn its online courses into major profit-makers. Hence its commitment to keeping its software open-source, so that others can use and build on it. That dovetails with Google’s own approach. Last year the search behemoth launched Course Builder, its own open-source platform for creating online courses. In a blog post announcing the company’s partnership with EdX, director of research Dan Clancy said that Google will take what it has learned from Course Builder and apply it to Open EdX and Mooc.org. It seems likely that Course Builder will in fact eventually be rolled into Mooc.org, though Google said it will continue to maintain the site for the time being. We have long admired Google’s commitment to open access to information, and we believe they will be a perfect partner to work with as we shape the next generation of open education and learning. Google shares our mission to improve learning both on-campus and online. Working with Google’s world-class engineers and technology will enable us to advance online, on-campus and blended learning experiences faster and more effectively than ever before. Even nonprofits have to make some money somehow, whether by donations, subscriptions, or otherwise. But when I asked him whether Mooc.org might be ad-supported, Agarwal said EdX and Google haven’t talked much about any possible revenue model at this point. He also did not have details on how mooc.org might screen potential courses or whether those teaching courses on the site would be allowed to charge for them. Google, for its part, isn’t putting all its chips into EdX’s basket as it leaps into the online-learning game. The company also announced on Monday a partnership with Udacity and a slew of other organizations to form something called the Open Education Alliance. That project is geared specifically toward teaching students and workers around the world the skills needed to find jobs in the technology industry. But its partnership with EdX could have a wider impact on the suddenly quite-crowded MOOC space. By lending its considerable resources to that project, Google immediately raises the profile of the leading open-source alternative to Udacity and Coursera. At a time when universities’ rush to sign up with Coursera and other for-profit online-learning platforms is sparking something of a backlash, EdX’s approach could find more support among some professors and administrators. In short, Google doesn’t want to see a single 800-pound gorilla conquer the MOOC realm—especially if that gorilla doesn’t involve Google.